Three years ago my wife and I were in Belize on a cruise. We elected not to do what tourists do, go scuba diving, etc. We walked around the port and met a guy and his wife who offered to take us on a tour of Belize. We agreed on a price but I told him I wanted to see the "real Belize.' 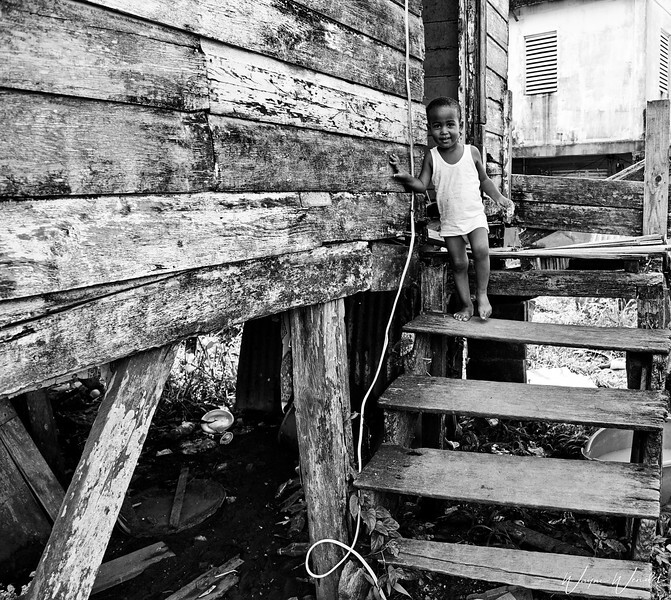 The Belize that tourists don't see. This little guy was so friendly, that we wanted to hug him. Wonderful b/w portrait...super textures and a lovely capture of the little boy! I love this photo! What a cute little fellow. We do the same thing when we are visiting most places. We try to find a local that will show us around and give us the history, the places the locals love, and the real area. One of our best was in Nassau Bahamas about 7 years ago or so. It was great. Love this shot Wayne, it's a winner. Oh, how sweet and adorable is this! You and your wife did exactly what my husband and I would have done (referencing seeing the "real Belize."). This is a great story-telling photo! As photographers I think we really need to see the backstreets, so to speak, not just the tropical beauty. Good work. Great shot catching the local colour!